I recently saw a blog post entitled Solving murder with Prolog. It was a good read, and I recommend it. One interesting aspect of the solution is that it reads somewhat like the original problem. Essentially, the author translated the clues into Prolog, and got a solution out automatically. This is actually an essential skill for programmers in general: good code should be readable, almost like plain English—and not just if you’re programming in Prolog. So today, I want to re-solve this problem in Go. As I go, I’ll explain how I optimized for readability. For the eager, here is the final solution. Here, we represent the solution by storing the person and weapon for each room. For example, to see the person in the living room, we check cfg.People[LivingRoom]. To see the weapon in the living room, we do cfg.Weapons[LivingRoom]. This will make it easy to implement clues in a readable fashion. For example, to verify the final clue, we simply check that cfg.Weapons[Pantry] == Gas, which reads just like the original clue. Note how this reads exactly like what we really want to do. We are looping through permutations of people and weapons, and we can see that easily. This is because we moved all the complex permutation generation logic into its own function; it’s abstracted away in a well-named container. Next, before we implement the actual clues, let’s implement some helper functions. Well-named helper functions greatly improve readability. Note in particular the isMan helper. It’s very clear what it does, and it abstracts away an arbitrary-seeming 3. Most of these clues read almost like the original. I have to admit that the indexOf logic isn’t perfect. Let me know how/if you’d do it better! Starting this holiday season, I want to take some time every day to focus on a broader set of topics than just machine learning. While ML is extremely valuable, working on it day after day has given me tunnel vision. I think it’s important to remind myself that there’s more out there in the world of technology. This post is going to be an aspirational one. I started by listing a ton of things I’m embarrassed to know nothing about. Then, in the spirit of self-improvement, I came up with a list of project ideas for each topic. I find that I learn best by doing, so I hope these projects will help me master areas where I have little or no prior experience. And who knows, maybe others will benefit from this list as well! My knowledge of networking is severely lacking. First of all, I have no idea how the OS network stack works on either Linux or macOS. Also, I’ve never configured a complex network (e.g. for a datacenter), so I have a limited understanding of how routing works. I am so ignorant when it comes to networking that I often struggle to formulate questions about it. Hopefully, my questions and project ideas actually make sense and turn out to be feasible. What APIs does your OS provide to intercept or manipulate network traffic? What actually happens when you connect to a WiFi network? What is a network interface? How is traffic routed through network interfaces? How do VPNs work internally (both on the server and on the client)? How flexible are Linux networking primitives? How does iptables work on Linux? What’s it actually do? How do NATs deal with different kinds of traffic (e.g. ICMP)? How does DNS work? How do DNS records propagate? How do custom nameservers (e.g. with NS records) work? How does something like iodine work? Re-implement something like Little Snitch. Try using the Berkeley Packet Filter (or some other API) to make a live bandwidth monitor. Implement a packet-level WiFi client that gets all the way up to being able to make DNS queries. I started this with gofi and wifistack, but never finished. Implement a program that exposes a fake LAN with a fake web server on some fake IP address. This will involve writing your own network stack. Implement a user-space NAT that exposes a fake “gateway” through a tunnel interface. Re-implement iodine in a way that parallelizes packet transmission to be faster on satellite internet connections (like on an airplane). Re-implement something like ifconfig using system calls. Connect your computer to both Ethernet and WiFi, and try to write a program that parallelizes an HTTP download over both interfaces simultaneously. Write a script to DOS a VPN server by allocating a ton of IP addresses. Write a simple VPN-like protocol and make a server/client for it. Try to set something up where you can create a new Docker container and assign it its own IP address from a VPN. Try to implement a simple firewall program that hooks into the same level of the network stack as iptables. Implement a fake DNS server and setup your router to use it. The DNS server could forward most requests to a real DNS server, but provide fake addresses for specific domains of your choosing. This would be fun for silly pranks, or for logging domains people visit. Try to bypass WiFi paywalls at hotels, airports, etc. Cryptocurrencies are extremely popular right now. So, as a tech nerd, I feel kind of lame knowing nothing about them. Maybe I should fix that! How do cryptocurrencies actually work? What kinds of network protocols do cryptocurrencies use? What does it mean that Ethereum is a distributed virtual machine? What computations are actually involved in mining cryptocurrencies? Write a script that, without using high-level APIs, transfers some cryptocurrency (e.g. Bitcoin) from one wallet to another. Write a small program (e.g. “Hello World”) that runs on the Ethereum VM. I honestly don’t even know if this is possible. Try writing a Bitcoin mining program from scratch. Before OpenAI, I worked mostly on solitary projects. As a result, I only used a small subset of the features offered by source control tools like Git. I never had to deal with complex merge conflicts, rebases, etc. What are some complicated use-cases for git rebase? How do code reviews typically work on large open source projects? What protocol does git use for remotes? Is a Github repository just a .git directory on a server, or is there more to it than that? What are some common/useful git commands besides git push, git pull, git add, git commit, git merge, git remote, git checkout, git branch, and git rebase? Also, what are some unusual/useful flags for the aforementioned commands? How do you actually set up an editor to work with git add -p? How does git store data internally? Try to write a script that uses sockets/HTTPS/SSH to push code to a Github repo. Don’t use any local git commands or APIs. On your own repos, intentionally get yourself into source control messes that you have to figure your way out of. Submit more pull requests to big open source projects. Read a ton of git man pages. Write a program from scratch that converts tarballs to .git directories. The .git directory would represent a repository with a single commit that adds all the files from the tarball. How do SOTA object detection systems work? How do OCR systems deal with variable-length strings in images? How do neural style transfer and CycleGAN actually work? Make a program that puts boxes around people’s noses in movies. 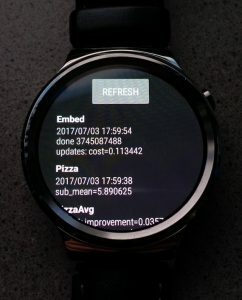 Make a screenshot-to-text system (easy to generate training data!). Try to make something that takes MNIST digits and makes them look like SVHN digits. For something so ubiquitous, phones are still a mystery to me. I’m not sure how easy it is to learn about phones as a user hacking away in his apartment, but I can always try! What does the SMS protocol actually look like? How is the data transmitted? Why do different carriers seem to have different character limits? How does modern telephony work? How are calls routed? Why is it so easy to spoof a phone number, and how does one do it? How are Android apps packaged, and how easy is it to reverse engineer them? Try reverse engineering SMS apps on your phone. Figure out what APIs deal with SMS messages, and how messages get from the UI all the way to the cellular antenna. Try to encode and send an SMS message from as low a level as possible. Get a job at Verizon/AT&T/Sprint/T-Mobile. This is probably not worth it, but telephony is one of those topics that seem pretty hard to learn about from the outside. I don’t take full advantage of many of the applications I use. I could probably get a decent productivity boost by simply learning more about these tools. How do you use ViM macros? What useful keyboard shortcuts does Atom provide? How do custom go get URLs work? How are man pages formatted, and how can I write a good man page? Use a ViM macro to un-indent a chunk of lines by one space. For a day, don’t let yourself use the mouse at all in your text editor. Lookup keyboard shortcuts all you want. For a day, use your editor for all development (including running your code). Feasible with e.g. Hydrogen. Make a go get service that allows for semantic versioning wildcards (e.g. go get myservice.org/github.com/unixpickle/somelib/0.1.x). Write man pages for some existing open source projects. I bet everybody will thank you. The MNIST dataset is split into 60K training images and 10K test images. Everyone pretty much assumes that the training images are enough to learn how to classify the test images, but this is not necessarily the case. So today, in the theme of being a contrarian, I’ll show you how to split the 70K MNIST images in an adversarial manner, such that models trained on the adversarial training set perform poorly on the adversarial test set. Class imbalance is the most obvious way to make an adversarial split. If you put all the 2’s in the test set, then a model trained on the training set will miss all those 2’s. However, since this answer is fairly boring and doesn’t say very much, let’s assume for the rest of this post that we want class balance. In other words, we want the test set to contain 1K examples of each digit. This also means that, just by looking at the labels, you won’t be able to tell that the split is adversarial. Here’s another idea: we can train a model on all 70K digits, then get the test set by picking the digits that have the worst loss. What we end up with is a test set that contains the “worst” 1K examples of each class. It turns out that this approach gives good results, even with fairly simple models. When I tried the above idea with a small, single-layer MLP, the results were surprisingly good. The model, while extremely simple, gets 97% test accuracy on the standard MNIST split. On the adversarial split, however, it only gets 81% test accuracy. Additionally, if you actually look at the samples in the training set versus those in the test set, the difference is quite noticeable. The test set consists of a bunch of distorted, smudgy, or partially-drawn digits. Training samples (left), testing samples (right). In a sense, the result I just described was obtained by cheating. I used a certain architecture to generate an adversarial split, and then I used the same architecture to test the effectiveness of that split. Perhaps I just made a split that’s hard for an MLP, but not hard in general. To truly demonstrate that the split is adversarial, I needed to test it on a different architecture. To this end, I tried a simple CNN that gets 99% accuracy on the standard test set. On the MLP-generated adversarial split, this model gets a whopping 87% test accuracy. So, it’s pretty clear that the adversarial split works across architectures. Use an ensemble of architectures to select the adversarial test set. Use some kind of iterative process, continually making the split worse and worse. Try some kind of clustering algorithm to make a test set that is a fundamentally different distribution than the training set. Maybe this result doesn’t mean anything, but I still think it’s cool. It shows that the way you choose a train/test split can matter. It also shows that, perhaps, MNIST is not as uniform as people think. OpenAI Universe was very exciting when it first came out. With Universe, it was suddenly possible to train AI to play Flash games, book flights online, and perform various other real-world tasks. Unfortunately, Universe never really took off in the AI world. I don’t know why others aren’t using Universe, but I can tell you why I’m not using it and why I am working hard to build an alternative. Since Universe has a lot of moving pieces, I’ll give a basic overview of how it works. Every Universe environment runs an instance of Chrome inside a Docker container. An AI interacts with the environment using VNC, which can send keyboard and mouse inputs to Chrome and receive back screen images in real time. To train RL agents on Flash games, Universe uses OCR to read the score off the screen and send it back to the agent as a reward signal. A program in the container controls game flow by looking at the screen and waiting for menus and “game over” pages. In my view, the biggest problem with Universe is that VNC and Flash need to run in real time. This means that any hiccups on your training machine (e.g. a CPU spike due to a software update) might suddenly change the frame rate at which your AI experiences its virtual environment. It also means that you can’t run Universe at all on a slow machine. This rules out many cloud-hosting instances, for example many EC2 t2 instances. Since Flash games are hard to reverse-engineer, Universe has no choice but to look at the screen to figure out the state of a game. This approach isn’t very stable. Imagine a game where the “game over” screen fades in gradually, but the “Submit Highscore” button on said screen can be pressed before the fade is complete. If you are running a random agent (one which clicks randomly), it might hit “Submit Highscore” before Universe is able to detect the “game over” screen. The result is that a strange new screen will pop up instead of the “game over” screen, and the Universe infrastructure will crash. I talk more about this flaw in this unresolved Github issue. This is a real issue because most RL algorithms start by taking random actions to explore the environment. In upcoming weeks, we’ll release our environment integration tools, so anyone can contribute new environment integrations. We’re compiling a large dataset of human demonstrations on Universe environments, which will be released publicly. That never happened either, which saddens me since I would have loved to get my hands on that data. In μniverse, it is easy to guarantee that all actions are “safe”. In other words, μniverse ensures that there is nothing the agent can do to escape or break its environment. For example, it is easy to disable things like the “Back to Main Menu” button present in many games. Universe attempted to do this by forbidding clicks at certain locations, but it is undocumented and not fully supported. I’ve been adding games to μniverse for a few weeks now. Right now I’ve integrated 27 games, and I expect that number to keep rising (update Jun 26, 2017: up to 54 games now). As I go, I’ve been training AI agents on some of the new games. It’s very satisfying to see AI perform better than me at some games. Throughout this process, I have to say that μniverse has felt more stable than Universe (I’ve trained games using both systems). μniverse is also much faster in terms of environment boot times, but that’s just a bonus. Over the course of billions of years, a crude meta-learning algorithm was able to produce the brain. This meta-learning algorithm, known as biological evolution, is slow and inefficient. Nevertheless, it produced organisms that can learn to solve complex problems in a matter of seconds. In essence, a slow and inefficient learning algorithm produced a fast and efficient one. That’s the beauty of meta-learning, and it’s what I believe will lead to strong AI. Today, in 2017, meta-learning is still in its infancy. There are few papers published on the subject, and they all approach fairly easy problems. For more details on this, I have a YouTube video that describes the current state of meta-learning. This is where my quest comes in. Meta-learning is far from producing strong AI, but I want to take it several steps closer. The first step in my quest was to develop a meta-learning algorithm that could plausibly scale up to human-level intelligence. To this end, I developed a memory-augmented neural network (MANN) which I call sgdstore. Unlike other MANNs, sgdstore works by training a neural network dynamically and using the ever-changing network as a large memory bank. I have had great successes with sgdstore, and I believe it’s ready for harder challenges. As a meta-learning algorithm, evolution had to produce adaptable creatures that could succeed in many diverse situations. If we want to use meta-learning to produce strong AI, we will need our own set of diverse challenges for meta-learning to solve. For this set of challenges, I am looking to OpenAI Universe. Universe has over 1,000 virtual environments, many of which are video games. If I could use meta-learning to teach an sgdstore model to play new video games quickly, that would be a huge step forward. After all, life isn’t very far from a video game. By the way, the idea of using meta-learning on OpenAI Universe is not a brand-new idea. Ilya Sutskever gave a talk in 2016 about this very subject. However, while the idea is simple, there are many technical obstacles in the way. I suspect that Evolution Strategies was part of OpenAI’s approach to overcoming these obstacles. As I will describe, I am taking a slightly different path. Among the many technical difficulties involved in meta-learning, one is particularly troublesome: memory consumption. My sgdstore model is trained via back-propagation, the traditional algorithm for training neural networks. As it runs, back-propagation needs to store intermediate values. This means that, as episodes of training get longer and longer, memory consumption grows worse and worse. To give you an idea, the meta-learning tasks with which I’ve tested sgdstore are on the order of 100 time-steps. If a video game is played at 10 frames-per-second, then 5 minutes of play would amount to 3,000 time-steps. Without any modification to my algorithm, this would be infeasible. Luckily, there are algorithms to make back-propagation use asymptotically less memory. In the extreme, it’s possible to make memory consumption grow logarithmically with episode length (a huge win). I actually thought of that algorithm myself, but of course–knowing my luck–it was already known. I went ahead and implemented the algorithm in a Github repo called lazyrnn. I am confident that it will come in handy. As an aside, OpenAI’s recent variant of Evolution Strategies addresses the memory issue in a different way. By avoiding back-propagation, ES does not need more memory for longer episodes. However, there are other difficulties with ES that make me shy away from it. For one, it seems to depend greatly on network parameterization and weight decay, both things which I doubt will lend themselves nicely to Recurrent Neural Networks like sgdstore or LSTM. Now that I have a way of training sgdstore on long episodes (lazyrnn), and I have a source of simulated experience (OpenAI Universe), I am left with one final task. Since the meta-learner will be performing reinforcement learning (learning from a reward signal), I need to implement a powerful RL algorithm. For this, I plan to use Trust Region Policy Optimization (TRPO). TRPO is pretty much the state of the art when it comes to RL. Today and yesterday, I have been implementing forward automatic-differentiation so that I can compute Fisher-vector products for TRPO. I hope to have TRPO implemented within the next few days, at which point I will begin my meta-learning experiments. With any luck, sgdstore will be able to learn something. From my experience, though, I doubt anything will work on the first try. I’m sure many challenges await me. Until yesterday, my ML framework’s vector library did not support aliasing. When you sliced a vector, you created a copy. I thought this would make things easier for a few reasons. For one, aliasing means that you have to worry about overlapping memory regions. Have you ever tried to implement your own version of memmove()? It’s not fun. However, after months of working with my framework, it became abundantly clear that aliasing would be nice to have. As a note, Java suffers from exactly what I described above. Since there’s no array aliasing, the Arrays class is cluttered with method variants like fill(short a, int fromIndex, int toIndex, short val). If Java arrays worked like Go slices, you wouldn’t need those pesky index arguments. If all your APIs took these structures instead of arrays, then you could slice for free. But now you’ve implemented aliasing! You would have all the same problems you’d have with aliasing: overlapping array arguments, weird bugs relating to mutability, etc. So why not just use aliasing from the start? Overall, it’s surprising how little I thought about aliasing before creating my own vector library. Usually it’s not an issue. It was only yesterday, when I profiled a program and found that 30% of its overhead was coming from vector slicing, that I finally decided in favor of aliasing. After getting my hands on a good GPU, I spent a month trying to train a single neural network. The network wasn’t even that special—it was just an image classifier. In case you don’t know, an image classifier tries to name the objects in images. You might show it a picture of a phone, for example, and it’d output something like “rotary phone”. This is an extremely popular application of neural networks, so I figured I was in for an easy ride. To my disappointment, the network was doing really poorly. I expected an error rate of about 7%, but I was getting more like 35%. I tried lots of different fixes: changing the batch size, using different optimization algorithms, and even tinkering with L2 regularization. Nothing seemed to help. I needed to be able to run experiments faster. After tweaking the network, I would have to wait a few days before seeing the (negative) results. I knew I hadn’t put much time into optimizing my code, so I figured I could squeeze more performance out of it. When I ran a profile, I found that most of the overhead wasn’t even coming from the network itself. Rather, data augmentation was taking up most of the training time. So, that code is pretty broken. For one thing, the x and y arguments are shadowed by the for loop variables, so I was always cropping the top-left corner out of every image. Second, the code was really slow because I was looping over the pixels of the larger image rather than only touching the pixels in the cropped region. 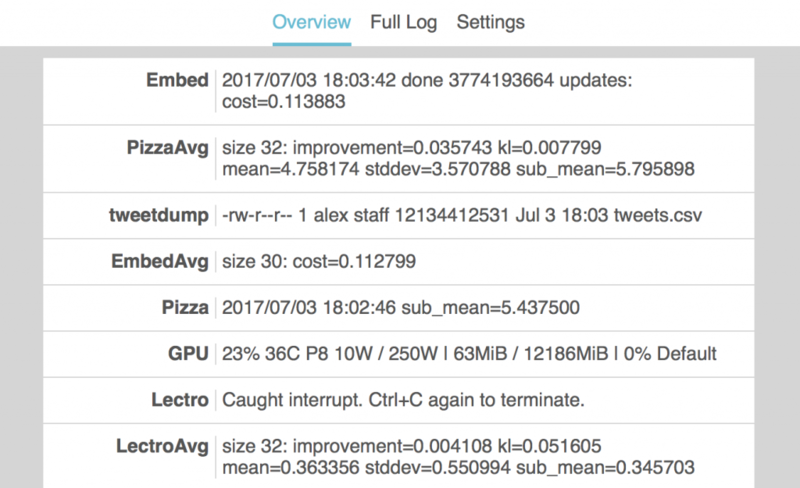 So, why was my neural network so bad? Because I was always feeding it the top-left corner of its training images. I don’t know if you’ve noticed, but the subject of a picture is rarely in the top-left corner. All things considered, it’s amazing that the network could get 60% accuracy with such terrible inputs. Now for the good news. After I replaced the cropping code with something sane, the network learned to classify images very well. It was a ResNet-34, and my results were comparable to the ones in the paper for the same network. And now that I finished what I set out to do, I have my GPU back. I can finally move on to more interesting things.